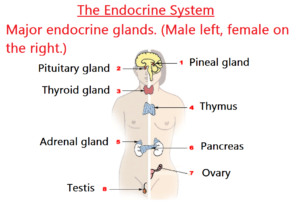 We have a system in the body called the endocrine system. It consists of the Central and the Peripheral Nervous System and internal organs that have specific glands and hormones. A hormone is a substance that produces chemical signals, which can be transported long distances to target various organs in the body. Hormones control a wide variety of functions in the body. If the various glands produce too little or too much hormone, different imbalances are created in the body. Hormone production is monitored and controlled in many cases by a so called negative feedback control system. This feedback system helps to balance the hormone concentrations to an appropriate level in the gland etc. If the control system does not work properly, medicine is needed to restore the balance. In many cases, however, good results are achieved using nutritional supplements or herbal remidies. Examples of imbalances are goiter, poor immune system, chronic fatigue, diabetes, PMS and other gynecological issues. Treatments that we use to restore the body’s hormone balance are herbal- and nutritional supplements, acupuncture and qigong.